Arguably, the 1960s was a decade that saw more cultural, social, and political changes than any other in the 20th century. In a revolt against the post war conservatism and staunch social regimen a counterculture emerged that reverberated throughout most of the Western World. What started with these “rebels” and the “Beat generation” in the 50s would mould and evolve into the hippies of the 60s and 70s spanning the social divides in terms of what was considered norms. The image would be typified by icons such as James Dean and Marlon Brando. This reverberated along the social revolution and down the decades. Naturally the humble blue jean was at the core of that persona. But even jeans were not exempt from the changes of the time, especially in image. What was traditionally a blue collar workwear was now a fully defined fashion. 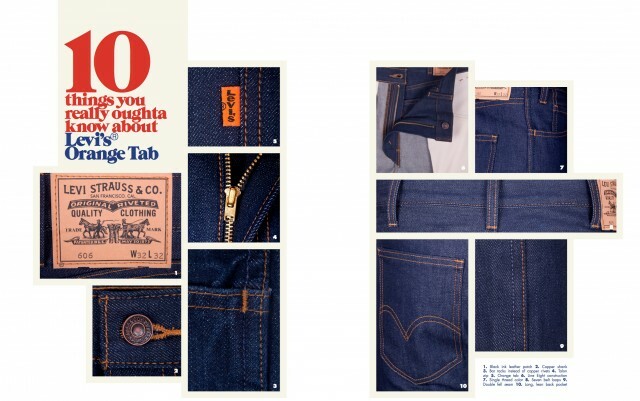 In recognition of this, towards the end of the 60s Levi’s introduced the Orange Tab. 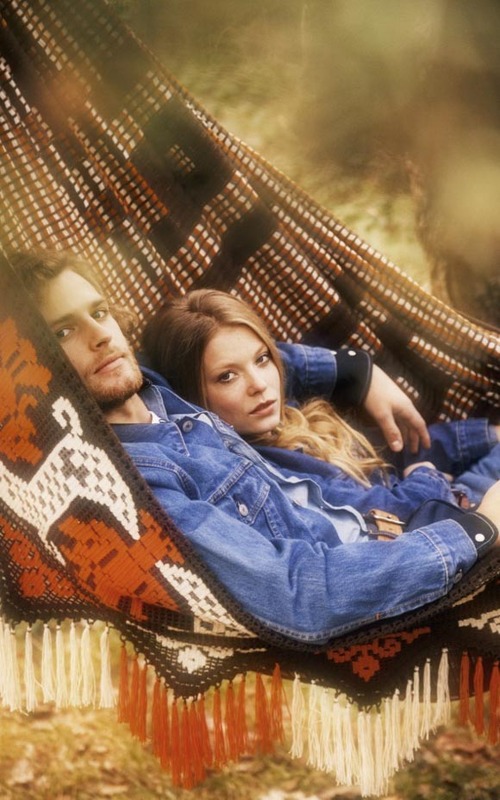 For the fall of 2013 Levi’s Vintage Clothing revives their youthful sublabel. The Orange Tab denims were an affordable alternative to the Red Tab workwear. Specifically targeted at the youth of America and the zeitgeist, the slim fits and contemporary styles reflected this and much as we are still seeing and feeling aspects of the 60s in modern day culture, so it is with jeans. You will see many of the features of the Orange Tab echoed in modern jeans such as the zipper fly and the replacement of rivets with bartacks. The overall construction of the jeans differs from Levi’s traditional method of manufacture. Other features that defined the departure from the Red Tab are an all black ink leather patch. ‘Line Eight construction’ with a double fell inseam. Seven belt loops instead of the traditional five and single tone contrast stitching overall. The rear pockets are square instead of tapered and lastly of course the Orange Tab instead of the Red. The jeans are available in three distinct cuts for men, the 606 Super Slim, 615 Regular Fit and the 607 Bootcut. For women there are a choice of two, again the 606 is a Super Slim cut and there is the 684, a very period fitting Bell Bottom. However, it is not just the jeans that are being resurrected, there are a number of other garments in the collection that fit perfectly with the style and ethos of the Orange Tab including t-shirts, shirts and an Orange Tab version of the Type III Trucker jacket. They are presented in very well executed washes evocative of vintage finds. 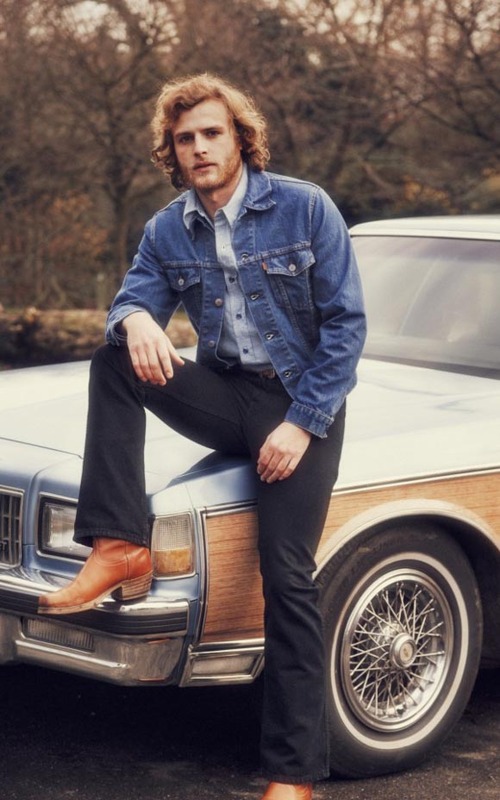 What is really worth taking notice of is that not only are the jeans exact replicas in terms and details and cuts, in fact all denim is lovingly crafted in the US to match the way in which the pieces were produced originally. This includes precisely the same thread, hardware and construction as described above, but most important Levi’s uses the same full width 14 oz. open end preshrunk denim produced by the famous Cone Mills with the exact same pure indigo shade woven on the same looms. And as Levi’s originally did in the 60s and 70s, this denim is used throughout the collection to keep costs down. All in all, the Orange Tab collection tells a tale of the time it hails from, evoking the spirit of the era. 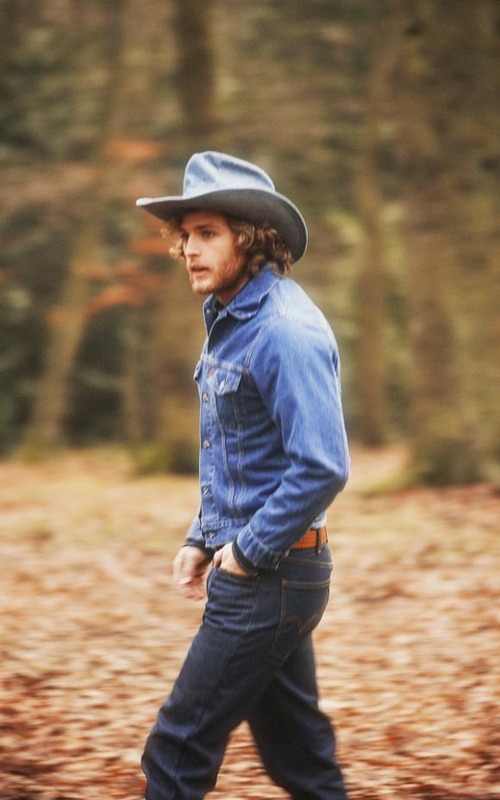 As always we are very impressed with the care and attention Levi’s Vintage Clothing put into their garments.